Trinity Lutheran Church was organized as a mission station from Zion Lutheran Church in Tawas City, MI in the late 1950’s. 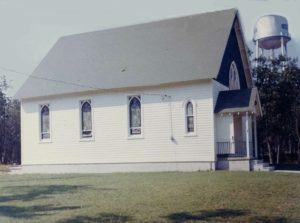 The first worship services and Sunday school were conducted on September 18, 1958 in the old Oscoda Community building. It was not long until a larger facility was needed and so Trinity congregation purchased property at 5625 N. US 23 and a building previously used by the Oscoda Methodist Church. To relocate this reclaimed church building, its roof had to be dismantled and reconstructed on the new site. 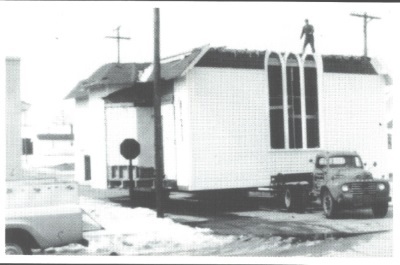 The wood-frame church house sat on our current property’s northwest corner where the storage barn is now located and was dedicated for the Lord’s use on June 28, 1959. In April of 1963 ground was broken for our present facility which was dedicated that same year on October 13. The new worship center consisted of a sanctuary, parish hall, kitchen, furnace room, one office, a cloak room and inside rest rooms. In 1973 the cloak room was changed to an office for the secretary. In 1981 a garage was added to store equipment with a covered patio adjacent for picnics and outdoor worship. In 1985 a 15ʹ x 20ʹ room was added to the south end of the Parish Hall to be used as a nursery and the parking lot was blacktopped. In 1992 Trinity bid farewell to many active duty airman, officers and their families as Wurtsmith AFB Closed. In 1994 faceted stained-glass windows and altar side lights were added and dedicated. In 1995 ground was broken for eight classrooms, two restrooms, a new kitchen, and secretary’s office. The cloak room was reclaimed. In 1996 The new addition was dedicated. In 1997 a new sign was purchased and dedicated on May 29. In 1998 an adjacent parcel was purchased from the township connecting the property to Cedar Lake Road. In 1999 the parking lot was expanded behind the education wing. In 2001 a storage barn was built where the old church once stood and a bell tower was constructed in the prayer garden. In 2005 the parking lot was resurfaced, and the expansion lot was paved. In 2013 Trinity celebrated 50 years with the expansion of the foyer under the current breezeway, repainting and installing dry wall in the sanctuary, new energy efficient windows were installed in the parish hall and offices, the sanctuary carpet was replaced, pew cushions were recovered, custom hand rails leading into the chancel were constructed, a new sound system was installed, the Allen organ was serviced, and the four organ speakers were rebuilt. In 2013 a fund drive was organized to purchase hand bells and the “Trinity Bells of Glory” choir was organized as an outreach choir, open to both members and non-members alike. In 2016, lighting in the entire building was converted to LED technology for greater energy efficiency. In the Fall of 2018 Trinity will be celebrating its 60th anniversary. Trinity Lutheran Congregation is a member of The Lutheran Church – Missouri Synod and continues to serve the townships of Oscoda, Au Sable and Greenbush with the Gospel of Jesus Christ for 60 years in Word, Sacrament, and Service.